*Wrestlers can weigh in with or without competition uniform. *Wrestlers will have the opportunity to weigh in the evening prior to and the morning of their tournament day. *There is NO weight allowance given at weigh-in. 1. All wrestlers will be required to complete a medical check with the tournament physician at the event. 2. 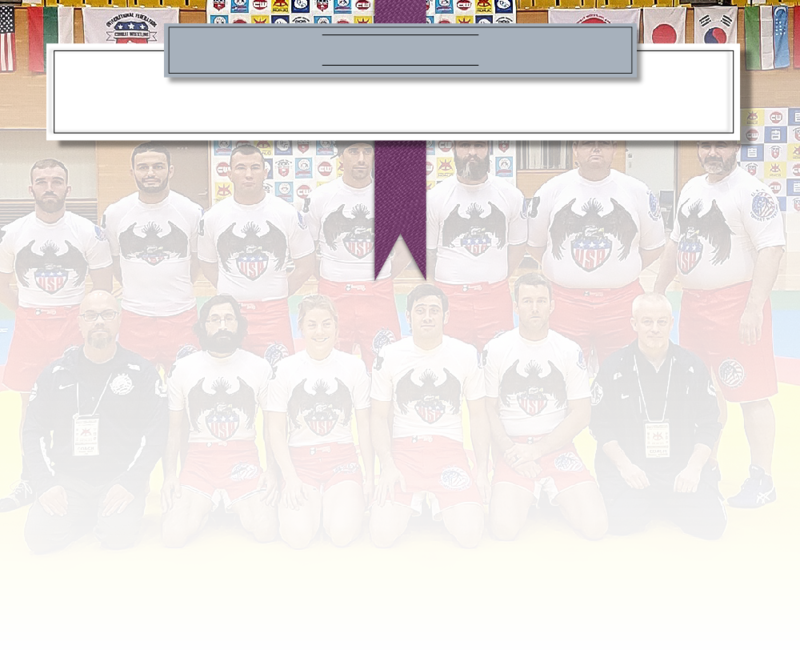 For international, continental and world championships, wrestlers MUST obtain and provide evidence of international sport or health insurance. *Event medical staff can disqualify any wrestler from competition for any reason believed to place the wrestler or his opponent in physical danger including, but not limited to: Dehydration, rapid heart rate, a concussion within the past 60 days, skin infections, or pre-existing medical conditions. *During the tournament, in the event the medical staff is occupied with an injured wrestler, or an ambulance is not present at the event (taking a wrestler to the hospital, for example), the tournament may not continue. Once the medical staff is available and able to supervise the tournament and the ambulance is present, the tournament may continue. 2. Subsequent to a takedown, wrestlers will be allowed to actively progress toward a pin or submission for a maximum of 30 seconds. Once a pin is secured, pin time will begin to be assessed by the referee (see below for pinning rules). After a pin is scored, wrestlers may continue to actively proceed to attempt a submission. Failure to actively progress toward a pin or submission will result in a stop of action and reposition standing. *Time clock will run continuously unless the referee signals for a pause of the clock. *Submission attempts will not be permitted continue past the end of match time. * If a pin is applied and being assessed by the referee at the end of the match time, the immobilization will be allowed to continue for the full length, even if exceeding the duration of the match. 1. All international, continental and world championships are single elimination. 2. National federations may individually determine format of national championships. 1. Red and blue shorts (compression or surf style. Shorts must not pass below the knee. No buttons, zippers or rubberized inner thighs are permitted). 2. Red and blue rash guard or tight fitting T-shirt. Loose fitting tops will not be permitted. 3. Wrestling or sambo shoes (of any color). No bare feet, trainers, sneakers, boxing shoes or any other kind of shoe will be permitted. *A wrestler may compete with either a solid blue/red top and or solid blue/red shorts. If a wrestler wishes to wear sponsor logos on their uniform, they can only be placed on the shorts OR the top, not both. The other must be kept either solid red or blue. 1. Physical tap or verbal submission to joint lock or strangle hold. The submitting wrestler MUST tap multiple times. Single physical taps will not be considered a submission. Loud screams or yelps at the time of a submission attempt may be considered a verbal submission by the referee. Scream at your own risk! 2. Technical victory via 12 point differential (For example: 0-12, 1-13, 2-14, etc.). A) Wrestler with less cautions wins. B) If neither wrestler has any cautions, or if both wrestlers have equal cautions, the wrestler with the highest scoring takedown will win. C) If neither player has a higher scoring takedown, the player with the most recent takedown score in the match will win. D) In the event the score is still equal, two extensions of 3 minutes are permitted. The wrestler who scores 2 or more points first wins. E) If the match finishes without a clear winner, the three match judges (center referee, table judge and mat side judge) will vote to declare a winner based on his performance (criteria being activity and attempts to finish the match). 1 point for throws or takedowns landing the wrestler on his front (belly) or on his buttocks, and he is not lifted off the mat above hip height of the attacking wrestler. 2 points for throws or takedowns landing the wrestler on his side (hip, shoulder or ribs), and he is not lifted off the mat above hip height of the attacking wrestler. 4 points for throws or takedowns landing the wrestler on his back, or throws which lift the wrestler off the mat with full rotation above of elevation of the attacking wrestler’s hips (landing position is not considered in throws where the wrestler is rotated or lifted above the attacking wrestler’s hip height for a throw). * Takedowns or throws to the knees, hands, or elbows will not be scored. *If one of the wrestlers jumps guard and the attacker’s momentum causes a drop to the mat, the move will be recognized as a throw for the defending wrestler. *Wrestlers are not penalized for disengaging subsequent to a throw (in other words, you can urge your opponent back to their feet). *Players who lift a grounded wrestler (from turtle or belly down position) above the elevation of the attacking wrestler’s hips can score throw points, IF there is an attempted positional change. If there is no positional change, the move is considered a slam, and is illegal (see below for further slam considerations). *Wrestlers using flying armbars, flying triangles, etc., must bring the defending wrestler to a grounded position (see definition below) for action to continue. Otherwise, the submission attempt will be considered a standing submission (illegal) and action will be stopped. *If a wrestler drops to a knee to execute a takedown (fireman carry, for example), and then stands to complete the action, the attacking wrestler must demonstrate control from the feet in order to score a standing takedown or throw. If control is not demonstrated, it will be scored as a takedown from the knee(s). *Throws and takedowns must demonstrate continuous action from initiation through landing to be scored. *Takedowns or throws initiated in-bounds, but landing out-of-bounds will be scored. 1 point for back mount (two hooks in for 3 seconds). 1 point for mount position (held for 3 seconds). *Back mount and full mount points can each be scored only once each per match. Pins are scored when the top wrestler has immobilized his opponent with torso to torso positions passed the guard (mount, side control, north-south, chest compression, etc.). A wrestler can score a pin from a back to chest position IF he is not being threatened by submission from bottom Wrestler. Pins are not scored from guard, half guard or if any form of leg entanglement is present. A pin is broken once a wrestler’s shoulders are tilted past a 90 degree angle to the mat. 1 point will be awarded for a 10-19 second pin. 3 points awarded for 20-29 second pin. 4 points awarded for 30 seconds. * A pin must be confirmed by 2 of the 3 judges for points to be awarded. *A maximum of 4 pin points can be scored per match. *A player can score a pin from a back to chest position IF he is not being threatened by submission from bottom player. 1. The referee IS REQUIRED to stop any match at any time if he or she feels any wrestler is in danger of serious injury or in need of exam by event medical officials. In such case the referee calls for a medical exam, he will signal a stop of the time clock. 2. The referee is at liberty to pause the match at any time and request examination of any wrestler by the event medical staff. If the match is paused for a medical concern about a wrestler, the maximum time allowed will be three minutes for the doctor to examine the wrestler or for the wrestler to recover from an injury. If after three minutes the medical exam is not finished or the injured wrestler can't continue, and the injury did not occur as a result of a foul; the uninjured wrestler will be declared winner. 3. The referee WILL stop the match and reposition the wrestlers standing in the center of the mat when one or both competitors are out-of-bounds (see definitions below). 4. The referee WILL stop the match and reposition the wrestlers standing if one wrestler stands to his feet and disengages during a grappling exchange. 5. The referee is at liberty to eject belligerent coaches or teammates from the mat area or arena. 6. The referee is at liberty to stop the match and reposition the players standing in the event of inactivity or non-combativity (see definition below). 7. The referee is required to enforce all point awards in accordance with these rules. 8. Standing escapes: The referee will immediately halt the action if a wrestler stands completely erect and lifts his or her opponent of the ground during an armbar, triangle, or similar submission attempt; or if a wrestler stands in an erect, balanced position of control over his/her opponent during an leg lock attempt. Submissions are only permitted on grounded wrestlers (see definition below). Wrestlers will be repositioned standing at center mat. 9. Only the center referee will have use of a whistle to stop action. In the event the table judge or mat side judge needs to stop the match, a buzzer, horn or bell must be used. 10. All three judges (center referee, table judge and mat side judge) must use official hand gestures to assess wrestler actions during the match. *Standing Out-Of-Bounds: Is when any two feet (from one or both wrestlers) step outside the warning zone of the mat area. * Grappling Out-Of-Bounds: Is when more than half of the wrestlers’ collective bodies are outside the warning zone of the mat area. A “caution” an official sanction by the judges to an offending wrestler in the case of a foul or instance of non-combativity. 1. First caution = No point deduction. 2. Second caution = 1 point given to the offended or fouled wrestler. 3. Third caution = 2 points given to the offended or fouled wrestler. 4. Fourth caution = Disqualification for the offending wrestler. A) Fail to engage (either standing or grappling). B) Continually retreat or back out-of bounds on the feet. C) Do not actively make forward progression towards a pin or submission attempt during grappling. D) Break a clinch and fail to follow up with counter attack. E) Flee the mat to escape a submission. a) Use of any prohibited action (foul). b) Use of non-submission and/or reckless actions and techniques intended OR resulting with actual or potential injury to their opponent. c) Verbal & physical aggression towards any event staff or official, by any wrestler, his or her coach, corner man or team-mate. d) Disruptive complaints to match officials or disregarding commands of the referee or event officials. *The referee can disqualify any wrestler at his discretion in the case of a flagrant foul. *Two of the three judges must agree before a caution can be assessed. *When a caution is to be assessed, the referee will stop the match, confer with other judges, award the caution and restart the wrestlers from standing position in the center of the mat. *The referee can simultaneously assess cautions to both wrestlers at his discretion if non-combativity is mutual. * When both wrestlers are in a grounded position and the attacking wrestler lifts and throws his opponent back on the mat in the same position, without attempt to alter the defending wrestler’s original position, regardless of the elevation of the lift, the move is recognized as slam and is prohibited. For example, slamming a wrestler who has pulled guard. *When both wrestlers are in a grounded position and the attacking wrestler lifts the other above the elevation of his own hips, with rotation and positional change of the defender, and throws him back on the mat, the move is recognized as lift or throw and is allowed. For example, a Karelin lift of a turtled wrestler. *If a wrestler is not able to continue after an illegal slam by his opponent, the attacking wrestler will be disqualified. If a wrestler cannot continue subsequent to a legal throw or a lift, it will be recognized as a medical disqualification. For preliminary matches: In the case a coach disagrees with the final outcome of a match, he or she may quietly ask the table judge for a ruling at the conclusion of the match. Any appeal of a preliminary match MUST be made before the initiation of the next match in that bracket. At the time of appeal, the three judges (table, mat side and center referee) will convene to hear the coach’s appeal, deliberate and make a final ruling. After hearing the coach’s appeal, the judges will review the official event video. Personal videos will not be considered. Once the judges have deliberated, the decision is considered final. Preliminary matches may not be appealed once the next match in the bracket has begun. For final matches: In the case a coach disagrees with the outcome of a final match, he or she may quietly ask the table judge for a ruling at the conclusion of the match. Any appeal of a final match MUST be made before the end of the day’s tournament activities. Appeals may not be made after the conclusion of the tournament. At the time of appeal, the three judges (table, mat side and center referee) will convene to hear the coach’s appeal, deliberate and make a final ruling. After hearing the coach’s appeal, the judges will review the official event video and make a final ruling. Personal videos will not be considered. In the event a coach still disagrees with the judges’ ruling on an appeal of a final match, he or she can submit a formal written appeal to the FICW referee committee. Written appeals must be submitted within 30 days of the event. Once received, the FICW referee committee must make a deliberation within 30 days and provide their decision in writing to the appealing party. FICW Referee Committee decisions are considered final.